The parish of Buckland Monachorum is located between Plymouth and Tavistock about 10 miles north of Plymouth city centre and on the edge of the Dartmoor National Park within the Borough of West Devon. The parish has five villages within its boundaries, Yelverton, Clearbrook, Crapstone, Milton Combe and of course Buckland Monachorum. Part of the parish falls within the National Park and the rest of it is within the Tamar Valley Area of Outstanding Natural Beauty. The Parish has many notable features such as Buckland Abbey the home of Sir Francis Drake now owned by the National Trust, the Garden House, and an old wartime airfield at 'Harrowbeer' Yelverton. The parish council was formed just over 100 years ago and has 12 members. The Council meet on the third Tuesday in every month except August when there is no meeting and in December when it is brought forward a week. The council also regularly meet to consider planning applications. Normally this is every fortnight but depends if any applications have been received. The dates and locations of all meeting are published on this site and on all parish notice boards. Please find the Notice of Poll here. Please find below the Notice/s of Uncontested Election indicating the persons who have been elected due to insufficient nominations being received for a poll to take place. THURSDAY 2ND MAY - including the election of 12 Councillors who make up Buckland Monachorum Parish Council. ( Feb 2019) NEED TO SPEND A PENNY? You may have seen recent articles about the decision by West Devon Borough Council to stop financially supporting public toilets. WDBC funding has been considerably reduced over the last couple of years and they cannot afford to keep paying for their upkeep. Recognising how important public toilets are, parish councils were offered the opportunity to take over the running of the facilities, and Buckland Monachorum Parish Council has agreed to take on the toilets at Yelverton but not those at Bedford Bridge. The final details are to be agreed but we anticipate the transfer will happen in April 2019. Many thanks to Sue Callow and her team from the Rock Inn for lighting up the tree on the Yelverton roundabout over the Festive season - a splendid job and much admired. CRAPSTONE WETLAND MEADOW - "THE OLD BOGGY BIT"
That "old boggy bit” in the corner of the recreation field in Crapstone is turning into a very special place. 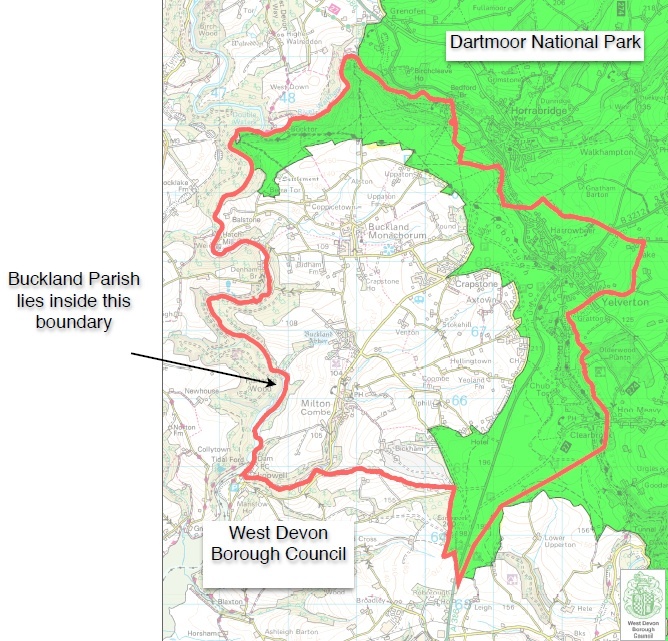 With the increasing urbanisation of our landscape it becomes more important than ever to conserve our natural areas such as this small pocket of wet grassland.The field is owned and managed by Buckland Monachorum parish council who in January 2018 gave a small committee, made up of three parish councillors and a few local residents the ½ acre plot “the boggy bit” to create a conservation area. Our first job was to get Tavistock task force out to clear some of the brambles and rushes so we could get an idea as to what we were going to do.Devon Wildlife had been down and had suggested a plan of action and our local well-known landscape gardeners had been and suggested a selection of trees, shrubs and flowers that would look good and increase the biodiversity of the area. With the help of local residents, we planted trees a shrub and some water loving plants, some of which had been donated to the conservation area. As we were fast running out of funds, we applied and got funding from Devon County council and the Tamer valley AONB, with a stall (books and toys) at Buckland village hall coffee morning plus the June fair, we were then able to buy a hedgehog home and a couple of bird boxes and our “big buy” which is an information board supplied and fitted by our local company “Green Scheme” who specialise in recycled plastic products, it will tell you all about our “boggy bit”. Volunteers are always welcomed. The wild life on our doorstep is amazing and so varied, we hope this year we will have even more to share with everyone. (9th July, 2018) BUCKLAND MONACHORUM PARISH COUNCIL HAS A NEW PARISH CLERK! From Monday, 9th of July, Katharine Griffiths will be taking over from Kelly Johns as the Parish Clerk. The PC is in the process of changing over telephone lines and there will be a week or so during which Parishioners will not be able to contact the PC via telephone. If you need to contact the Clerk it should be done by using the usual email address: clerk@bmpc.info All post should now be sent to : 5 Hillside Close, Buckland Monachorum, Yelverton, PL20 7EQ. NO MESSAGES LEFT ON THE OLD TELEPHONE NUMBER WILL BE FORWARDED TO THE PC, so please do not use it. Thank you for bearing with us during the changeover. (20th June, 2018 ) NOTICE: REPAIRS TO MEMORIALS IN CLOSED CHURCHYARD AND CEMETERY. The Parish Council has now completed its safety testing of memorials in both the Closed Churchyard and the Cemetery in Buckland Monachorum. A number of memorials have been identified as requiring remedial works to make them safe. Owners of the plots have until 6th July 2018, to contact the Parish Council, otherwise remedial works (either to repair or lay down the memorials), will go ahead after this date. To access the list of memorials that require repair click here. (14th June, 2018) DO YOU HAVE A PASSION FOR YOUR PARISH? APPLICATIONS ARE NOW INVITED FROM ELECTORS TO JOIN THE PARISH COUNCIL…..
Buckland Monachorum Parish Council invites registered electors in the Parish to apply to fill two Casual Vacancies that have arisen following the resignation of Cllr’s Britton & Hustler. The Parish Council consists of 12 Councillors. You don’t need any special qualifications to be a local Councillor (although there are qualifying criteria) but you do need to able to commit to a few hours every month for Council matters whether it's attending Council meetings, reading Council papers on community matters or catching up with local residents. So, if you have a passion and enthusiasm for your community then why not send in an application. The Parish Council does offer a varied and very rewarding opportunity to be a voice of your community, and to see and have a real involvement in how your Parish is managed and evolved. For more information or request an application pack, please contact the Clerk to Buckland Monachorum Parish Council on clerk@bmpc.infoor 01822 615893 (Tues to Thurs only, 10am to 12pm - answer machine for calls outside these hours or if Clerk unavailable). Both defibrillators have now been installed outside Milton Combe and Clearbrook Village Halls. The Parish Council is currently looking into the possibility of providing free training to the community. Watch this space for news. We are pleased to announce that the parish council has been awarded grant funding from the Town and Parish (TAP) fund, administered by West Devon Borough Council to provide two new defibrillators outside the main entrances to Milton Combe and Clearbrook Village Halls. The PC has funded the installation of two heated cabinets for the defibrillators to be stored in. The cabinets were installed last week and the defibrillators will be placed in the cabinets later this week. We are also in the process of orgainising training in the use of the units for anyone who wishes to know how to use them safely and effectively.